The Central Park Sketching and Art Meetup Group sketched at the Met yesterday - beginning in the Stieglitz, Steichen, Strand photography exhibit and ending in the American Wing. I thoroughly enjoy these sessions because I'm forced to select a subject and then to sketch it quickly before we move on. I saw the photography exhibit previously and loved Steichen's portrait of Stieglitz, so that was the subject of my first sketch. 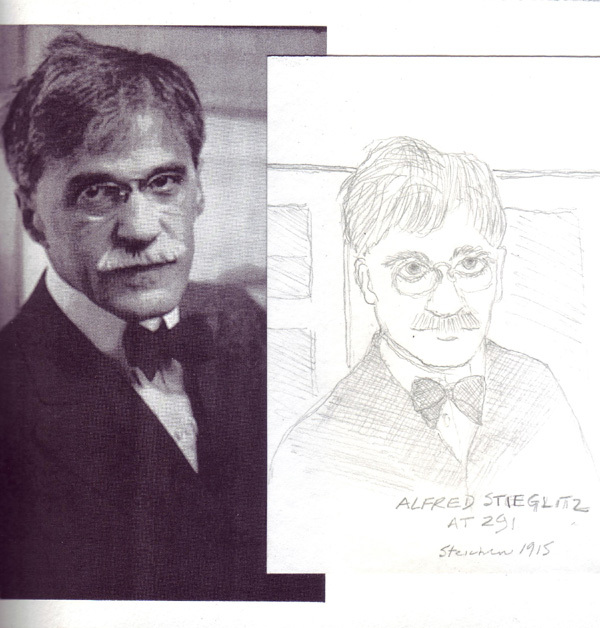 The Museum website has a good podcast and all of the exhibit photos - so I printed out the Stieglitz portrait to accompany my sketch when I got home. 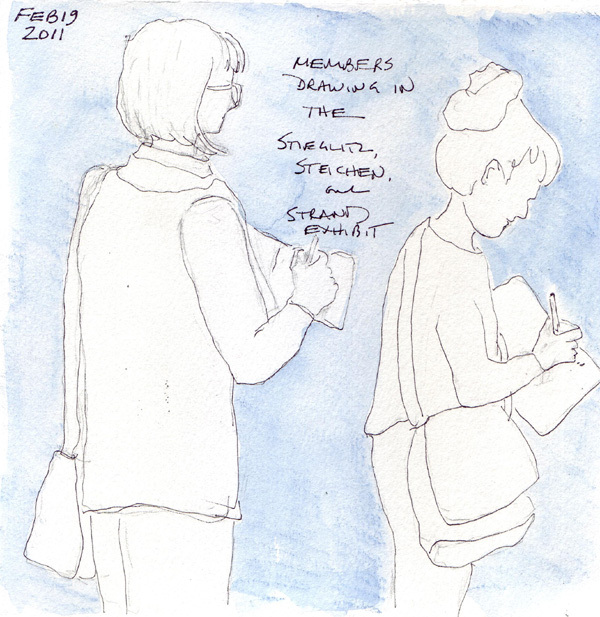 I also had a few minutes to sketch others in our group while they were sketching other photographs. 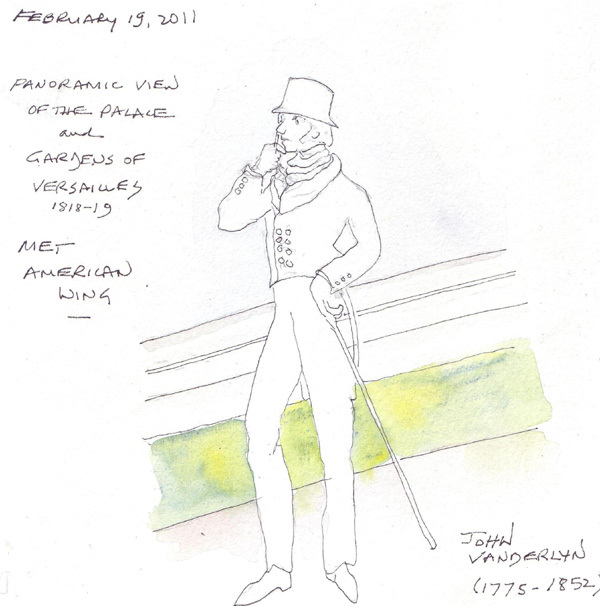 We then moved to the American Wing for several more sketches. For my final drawing, I sketched a tiny figure from a huge painting that completely lined a very large oval museum room. The painting is a Panoramic View of the Palace and Gardens of Versailles that was painted by an American artist named John Vanderlyn in 1818-19. The museum website has photos of sections of the whole painting and you can click among them. My man was one of many people in the painting that were strolling the grounds of Versailles. Our Meetup group leader took a low resolution photo of me while I was sitting on the floor sketching - and it shows the very large size of this painting. I go to figure drawing monthly at the Society of Illustrators and still love it. Tuesday night we had a male and female model and here are my 10 minute and 20 minute drawings. 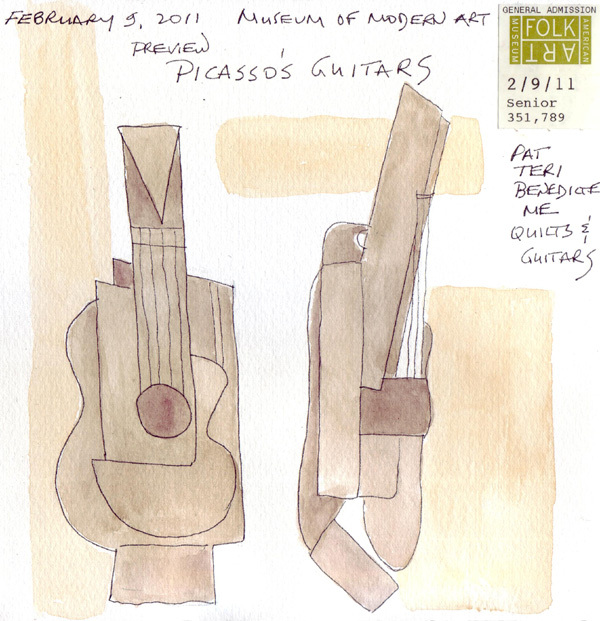 Picasso's Guitars 1912-1914 just opened at the Museum of Modern Art. The museum website for the exhibit is wonderful and ArtDaily.org has a great discussion of the exhibit with several photos. 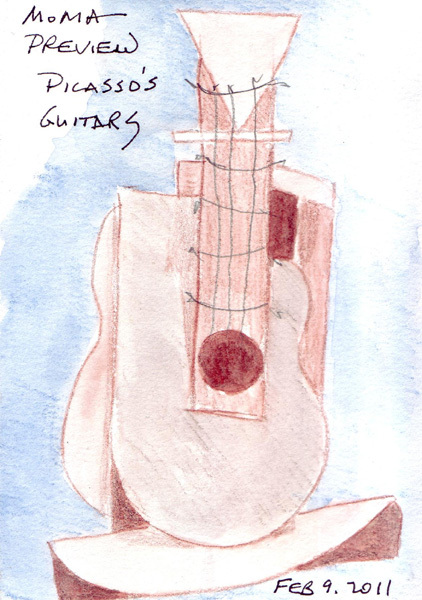 I saw "Guitars" last week with my Journal Study Group friends and did several sketches. I enjoyed reading and hearing about the uniqueness of Picasso's cardboard and string primitive wall sculpture and never realized what an important step this was in art history. My sketches include a flat version of the cardboard guitar, the metal guitar from the front and side to show the actual 3D shapes, and one of the exhibit collages - Student with a Pipe - just because I loved it! 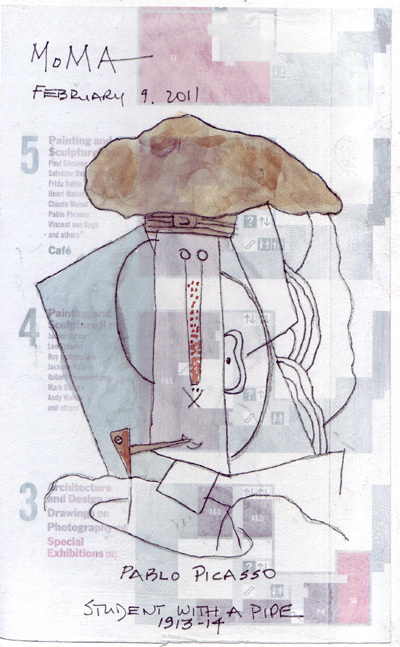 Collage - Student With Pipe: I sketched this piece at the exhibit and then redrew it at home in this version. There is a map of the galleries at MoMA as the first layer, then a layer of absorbent ground, then my drawing and watercolor paint to complete the image. My EDM "Select-a-Challenge Jar" is working well - and here are two challenges that I completed recently. I only select from the jar when I have absolutely NO IDEAS for my daily journal page because I've been hibernating! 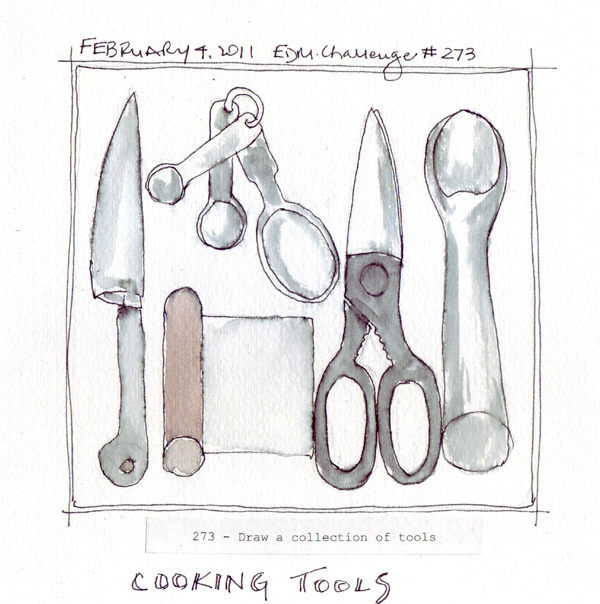 These were a few kitchen tools that were used that day. 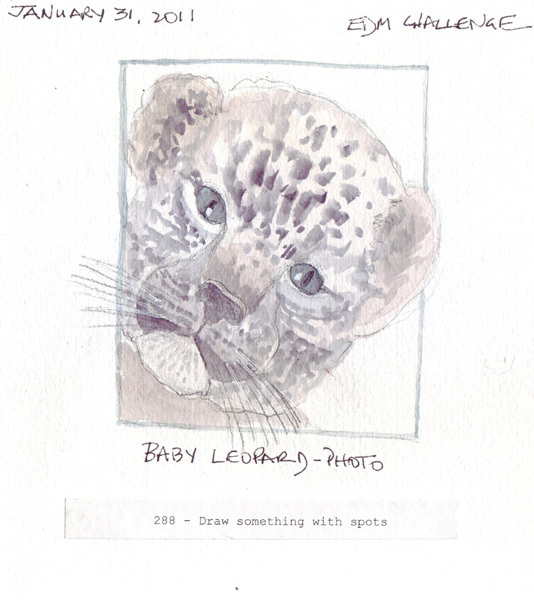 This baby leopard was drawn from a photo. The weather in New York City made it easy to hibernate and work on many projects around my apartment. But my lack of sensory input from my city environment made it necessary for me to dig deep and challenge myself to find anything of interest for my daily journal page. I know, I know - I could have added more apartment drawings to my precious watercolor journal, but I didn't! 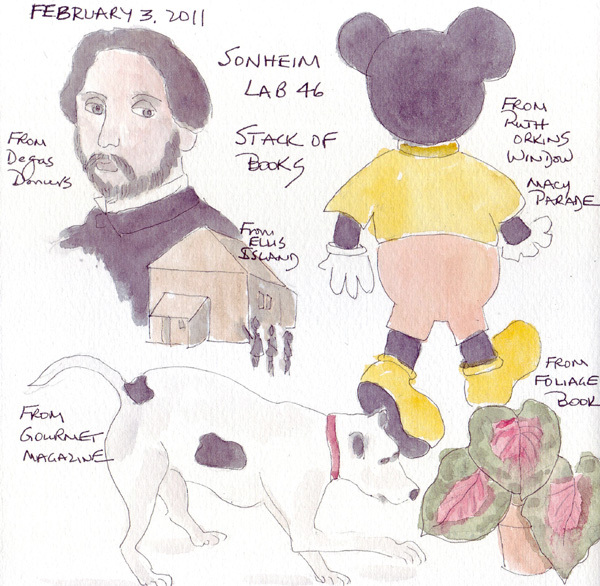 I am still working through the Carla Sonheim Drawing lab book and did two of her labs. 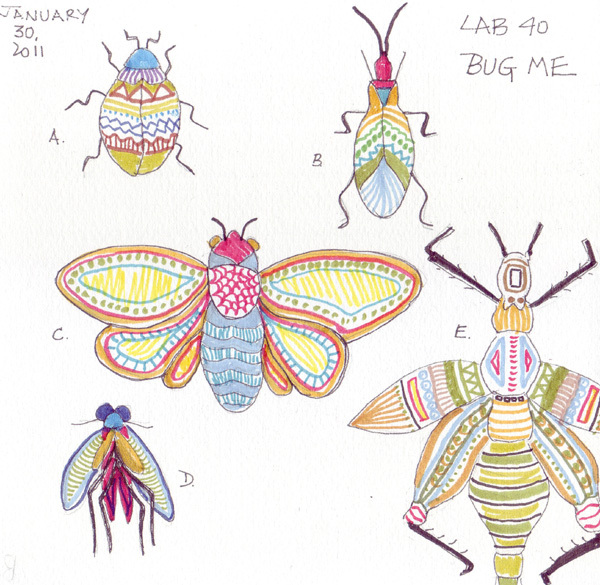 In the first, I searched for some bug shapes on Google images and then decorated them with Pitt pens. In the second, I quickly gathered 5 books from one bookshelf, just as quickly flipped them open and chose something to sketch, and then put the drawings on one page.